Here at Golf Rx we love to recognize products that are cool, innovative and performance oriented. We’ve just found one that disrupts the standard run-of-play, kind of by accident: the Vision Golf X-Grip glove. Vision Golf, out of Australia and under the successful management of Bill and Wayne Bosley, is more renowned for their creative application of UV technology in golf balls. We love this, and we’d actually love to explore a collaboration between our lenses and their UV balls, seeing what lenses we could pair with their respective balls for optimized visibility or somehow capitalizing on the mutual collision of UV in golf. Our lenses will block the UV and let you see the Vision balls, which require the UV. It’s the yin and yang of the sun’s radiation. There’s a relationship to be courted, for sure. Until then, we’ll just talk about these gloves and how much they rock. We got our hands on a few pairs, via a kind gift from a Golf Rx friend. At the moment they can be procured for a cool $19.95, but considering the long life-cycle and enduring performance of these gloves it’s a tricky business model to sell them so affordably; I would be neither surprised nor disappointed to see the price go up. The innovation warrants the price. Another complication to traditional gloves is that moisture tears them up. Whether it’s rain or sweat, it does a nasty number on your glove. Vision X-Grip gloves, being entirely synthetic, aren’t afraid of water or sweat and they help reduce the latter with the usual vents between the fingers and an unusually-breathable palm. 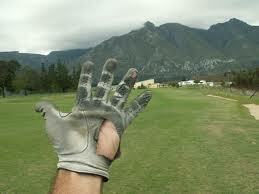 So, enter Vision Golf’s X-Grip golf glove. It’s constructed of a leather-resembling laminated polyurethane on the top of the hand which lends washability and recovery qualities to the fabric. Of course the true magic is in the palm. I’ll describe it as an extremely durable yet soft microfiber treated with a silicone dot pattern for grip. There is stretch throughout the palm and the rest of the hand, and to give an idea of the thickness of the palm material: When you hold it up to the sky it’s translucent not opaque. The combination is a highly durable glove, washable and water-friendly, that gives excellent grip and sacrifices just a little on hand feel. On the top of the palm is a slit near your knuckles, as well as on the fingers, to accommodate a bit more flex. The Velcro closure is secure and comfortable, and overall the glove feels like a very comfortable extension of your own skin, but just not to the same degree a thin sheepskin does. No one will re-appropriate this material to use in contraceptive devices, though as a testament to the precision dexterity it offers I do want to explain that I’ve typed this entire paragraph with a Vision X-Grip glove on my left hand with no fewer typos than normal. After many rounds and range sessions it’s quite apparent that these guys wear down much more slowly than other gloves. I’ve started to notice the wear at some of the major friction points and they’ve taken on some discoloration, but they are still entirely intact and performing just as well as they did on day one. Standard leather gloves, for an equal or higher price, would have blown out and gone crusty. Finally, as a note on grip, the silicone dots provide a less aggressive grip than some other gloves. They hold tight, but it’s a smooth, easy grip rather than an overwhelmingly sticky one. Overall, this glove has been a nice treat to come across. I’ll buy some out of my own pocket next time, and thankfully at a less frequent rate than I’d buy other gloves. 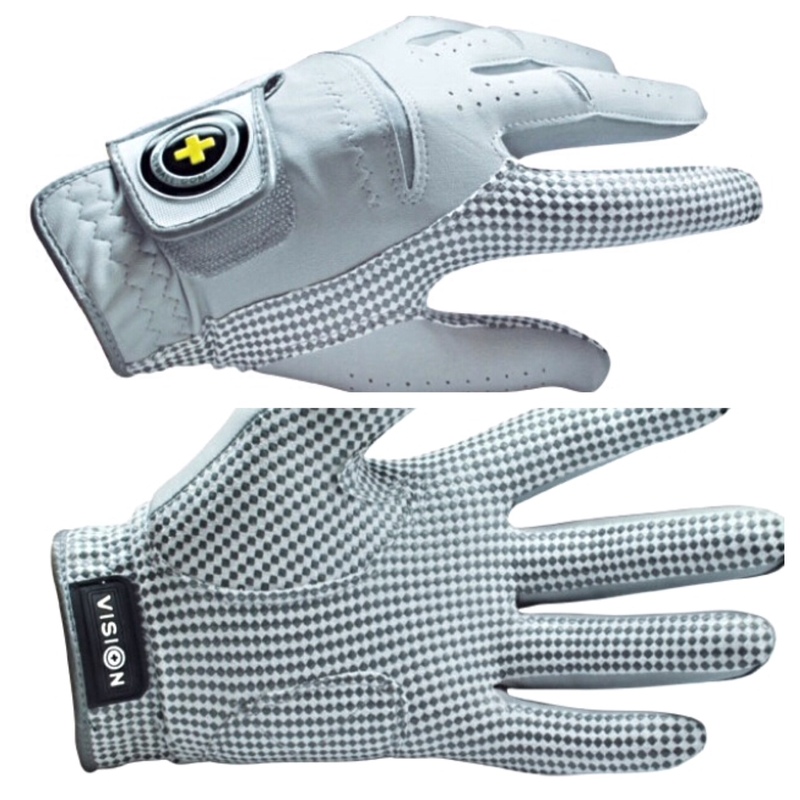 Check out Vision Golf and glove up. 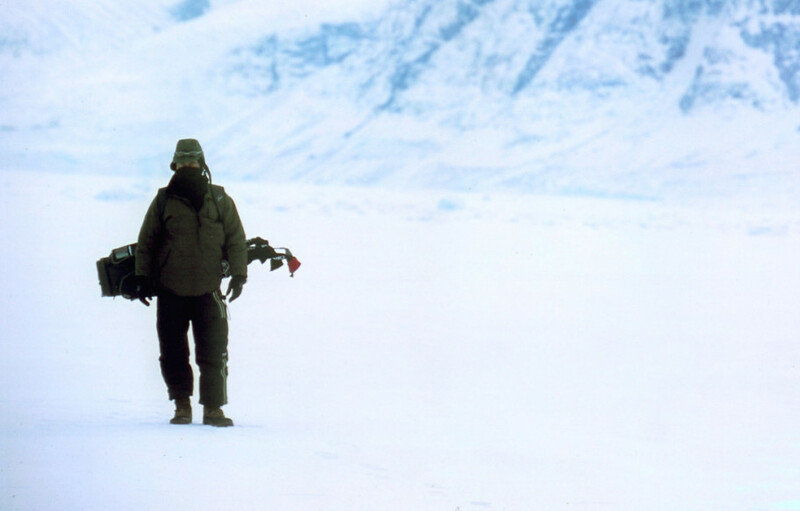 I came across this fascinating article on LinkedGolfers.com about the Drambuie World Ice Golf Championships in Greenland and the various sanctioned and non-sanctioned shenanigans that comprise the coldest golf event in the world. Written and experienced by Sean Kelly, it’s a great piece of travel writing that happens to be about golf. If you’re not familiar with Linked Golfers you should be, or you soon will be. It’s a golf website with an appreciation for experience and culture delivered with more grit, honesty and humor than many other sites, and the result is refreshing and engaging. Mr. Kelly produces a lot of the articles and content in a strong voice that examines various aspects of the contemporary golf world from travel to notable influencers to gear to community-building. The site also has an appreciation for gear that is developed with an eye on intense quality and attention to detail rather than marketing. Perhaps Golf Rx might one day earn their examination.